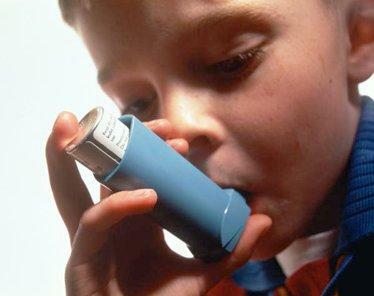 As kids, it seemed everyone had asthma. Either very mild or incapacitatingly severe. Most outgrow it without any real problems. Some suffer on for a bit longer. The unlucky ones have complications. One such complication is acid reflux, or Gastroesophageal reflux diseases. That burning sensation when the liquid content of the stomach regurgitates (backs up or refluxes) into the esophagus. The liquid, containing bile, acid and stomach enzymes, can inflame or damage the lining of the esophagus. Acid reflux and asthma have an interesting relationship. A lot of research has shown that acid reflux disease is more common in those with asthma than those without. Sometimes the typical symptoms of acid reflux disease isn’t apparent. In children with asthma about 40% of them have silent acid reflux disease. Untreated gastroesophageal reflux has been thought to be a cause of inadequate asthma control in children. One study by the American Lung Association Asthma Clinical Research Centers, highlighting the gap in the research in this are, sought to determine if anti-reflux therapy, the most common of which are prescribed proton pump inhibitors, improves control of asthma in children - an important clinical outcome. In adults, some studies have shown that proton pump inhibitors are help to manage asthma in those that show acid reflux symptoms, but for the asymptomatic the case is not as convincing. In children, proton pump inhibitors are often prescribed, especially for those kids whose asthma is poorly controlled, regardless of reflux symptoms. The trial was to study proton pump inhibitors in children with poorly controlled asthma that also did not show symptoms for acid reflux. Researchers were working on the hypothesis that children with symptomatic asthma taking inhaled corticosteroids (for their asthma) would have improved asthma control with lansoprazole (the proton pump inhibitor) treatment compared with placebo. Basically, the proton pump inhibitor would help with their asthma. More than 300 children and adolescents from 6 to 17 years old that did not have any overt symptoms of acid reflux were randomly assigned, along with their normal asthma treatment, a placebo or the proton pump inhibitor lansoprazole - once a day for 24 weeks. In the end, lansoprazole was no better than placebo. The results of this clinical trial are uniformly negative regarding the benefit of acid suppression therapy on symptom relief, lung function, airways reactivity, or quality of life. The research is beginning to build up a body of evidence that proton pump inhibitor treatment for poorly controlled asthma is not only not warranted but altogether useless. Despite their clean-cut outcome the researchers highlighted some areas that their study did not address that is worth doing in the future in order to find effective treatment therapy for these kids. Namely, the unclear possible role of nonacid reflux in worsening asthma control, and the observed failure of acid-suppressive therapy to improve asthma does not address this mechanism. That is so interesting. My son suffers from breathing trouble, and whenever he is having an attack he complains of his stomach hurting. I always just figured it was because he didn't know how to describe wheezing (he is only 4) and that it must use more stomach muscles to force breathing....thanks for enlightening me! I have observed a close relationship between children being treated for asthma and 'sore tummies'. My new interest relates to children being served MSG and reflux - my theory is based on observing the muscle tone of high msg consumers to those not consuming any. In particular the spincters of the body an how soft and yielding MSG seems to make them! When you yummy leaks avid you breathe it in 24/7. Good study populations in the Philippines for study as they are still high msg consumers.